Anxious to explore the mysterious hidden world under metropolitan Berlin, an international group of four urban explorers hires a local guide, Kris, who leads them into the maze of escape tunnels and subterranean fortifications under the city. Movies of this sort seem to be getting more and more popular every year, to be honest they can start to be become very predictable. "Urban Explorer" is along those lines but that doesn't mean it's not entertaining. Now I will warn you, this film does have subtitles, it's in English and German so if you don't like that sort of thing then stop reading now. I accidentally watched this the first time round without subtitles and found it freakier than when I saw it with subtitles, so there's a tip for you. I must admit that I'd never heard of any of the cast and crew but I was highly impressed with what I saw, I love watching films full of unknowns because that's when you discover new talent and one thing the Horror genre needs is fresh blood (pun intended). One cast member I was truly impressed with was Klaus Stiglmeier, he plays one of the creepiest bad guys I've seen in a long time. It takes quite a-lot to creep out this Horror veteran but he's truly disturbing and terrifying, you'll see what I mean if you watch it, heck just look at his picture above. The writing and directing aren't the best I've seen but this is pure talent that is finding it's feet, if these guys stay on the right tracks they could be making some our future favourites, you never know! I do love the gritty atmosphere the film has, it can make you feel very uncomfortable. 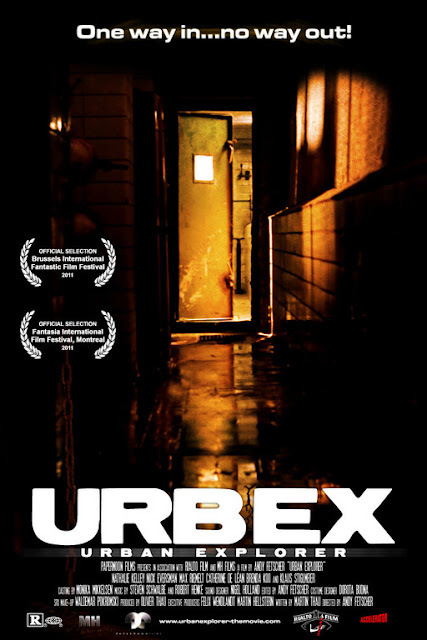 "Urban Explorer" isn't going to blow you away with originality but it's very gritty and dark, so, if like me, you like that sort of film then you'll find it highly entertaining.